I’m a big fan of any kind of chess pie. My Buttermilk, Peach Chess, and Eggnog Chess Pies are all delicious winners in my book. 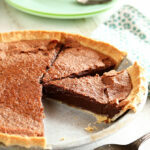 But I will admit that Chocolate Chess Pie is probably my favorite. 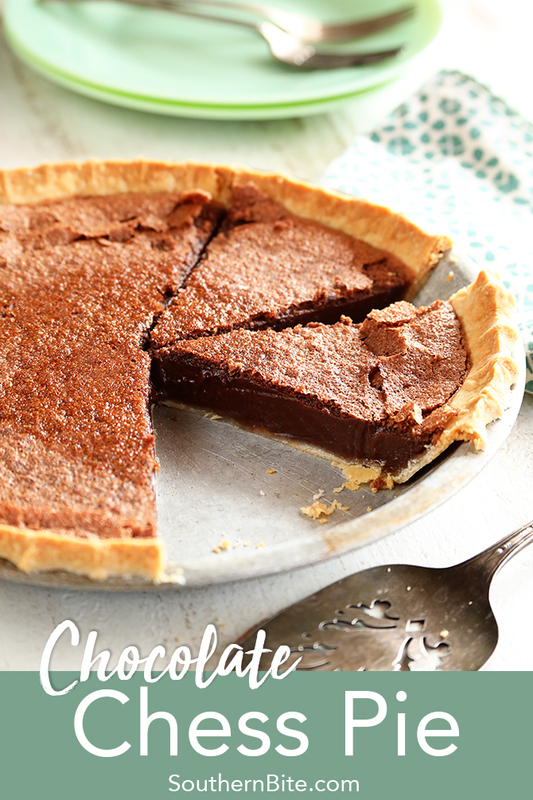 It just has the most perfect, creamy, chocolatey filling and I just love the crusty top that forms as it bakes. The best part, though, is how dang easy it is to make. You literally mix all the ingredients together and pour them into a prepared pie crust. 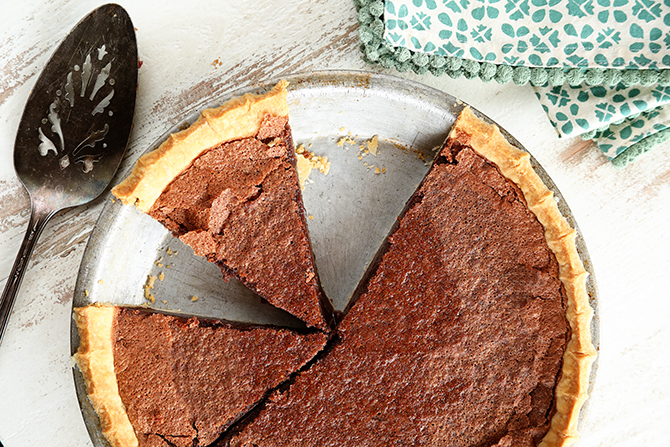 Regardless of what kind of crust you bake it in, this pie is destined to be a new family favorite. My folks just love it – and always have. It’s one of those classic southern recipes that has been around for ages. In fact, the original recipe I have made two pies – like many old pie recipes do – so I just cut everything in half to make one. As a result, this doubles beautifully if you need two pies. 🙂 And, I mean, who DOESN’T need two pies? Ha! Y’all enjoy! Preheat the oven to 325°F. In a large bowl, whisk together the cocoa powder, sugar, and corn starch. Add in the beaten egg, melted butter, milk, and vanilla. Stir well to combine. Pour the mixture into the unbaked pie shell and bake for 35 to 40 minutes or until a crust has formed completely across the top of the pie and is mostly set. Allow to cool completely before slicing and serving. Serve with a dollop of whipped cream, if desired. This looks like a winner to me…. I think I’ll make it this week. Thanks for your recipes. I’ve saved quite a few of them. All delicious! Love hearing that!! Thanks, Deanna! OOooh! I can’t wait to make this for my family for Valentine’s Day! Happy Hearts Day! Sure hope they’ll love it! Everyone DID love it, Stacey. You rocked our Valentine’s dessert! I just mistakenly added a whole 11 ounce can of Evaporated Milk instead of 5 ounce. I had to bake it a bit longer, but the flavor was milk chocolate goodness! Awesome!! So glad y’all enjoyed it!!! Did you really mean a 5 ounce can of evaporated milk or should it be 15 ounces? No, it’s a 5 ounce can. Hey y’all, can you make this without the crust? Just bake it in the pie shell? Has anybody tried that? I can’t say I’ve ever tried it that way. Is there a particular reason you want to bake it that way? Oh my goodness, this sounds like one everyone’s gonna have to try and love! Thanks for sharing! It’s best to control the salt content in the pie, but salted will work just fine. 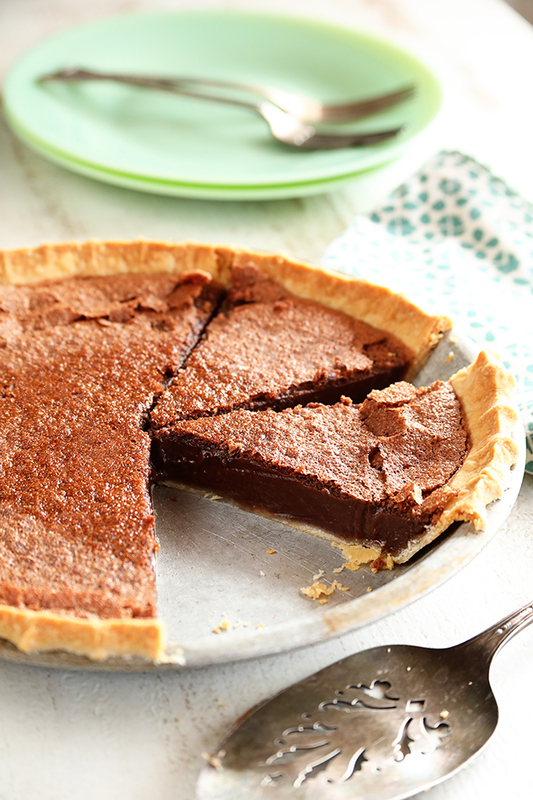 Can you use a deep dish pie crust for 1 pie or do you just need to use the regular pie crust? I’m using frozen ones in the tin pies. I just put mine in the oven in a frozen pie crust, and it filled fine, and doesn’t look too skimpy. My question is does a frozen crust need to be parbaked for this pie? No, there’s not need to par bake, but you can. 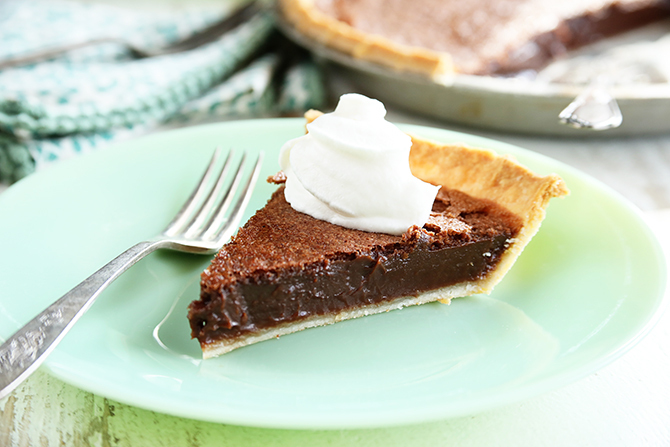 You just might need to shield the edges with some aluminum foil to keep it from getting too brown when baking the pie. Deep dish will work, it will just not fill it all the way up.